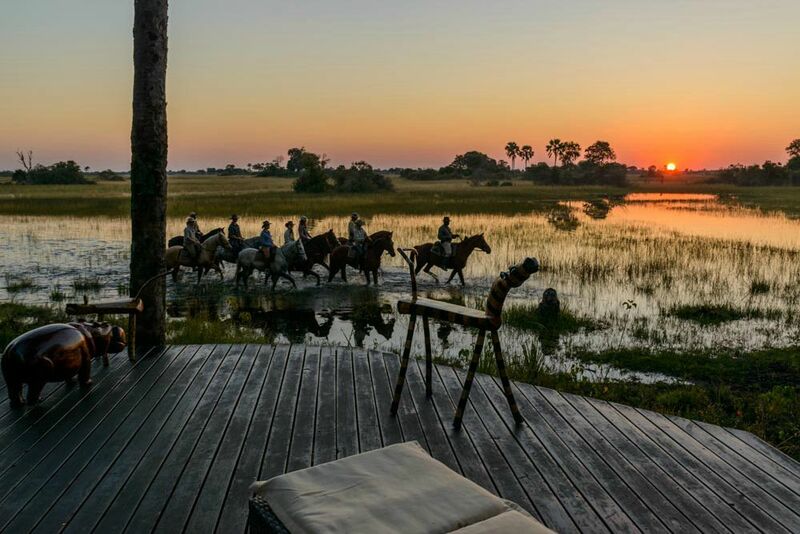 There is no better way to absorb the spectacular sights and sounds of the Okavango Delta in Botswana, and its wonderful array of wildlife, than on a horse riding safari. 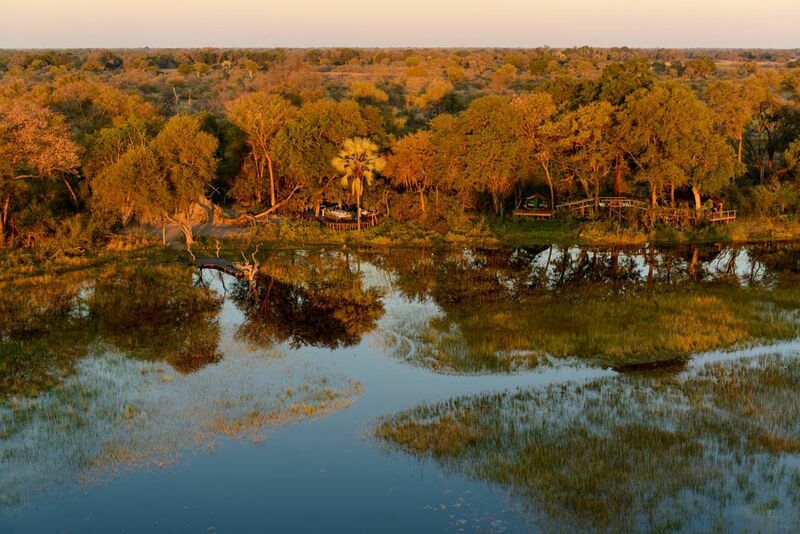 The Delta is a mosaic of islands, mopane forest, flood plains and streams stretching as far as they eye can see. Every year flooding makes huge areas of the Delta inaccessible to vehicles and thus leaves vast expanses of untouched land calling out to be discovered by horse, by far the most exciting way to explore. 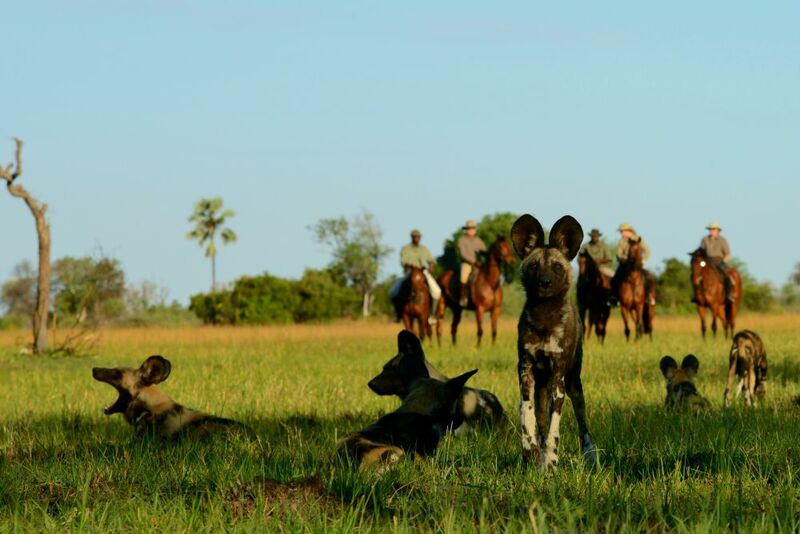 In the saddle and high above the tall grasses, game viewing is exceptional; riders can see giraffe, elephant, buffalo, zebra, many species of antelope and sometimes even hyena, lion or wild dog. The Delta is also renowned for some of the best bird watching in the world so make sure you bring your binoculars. 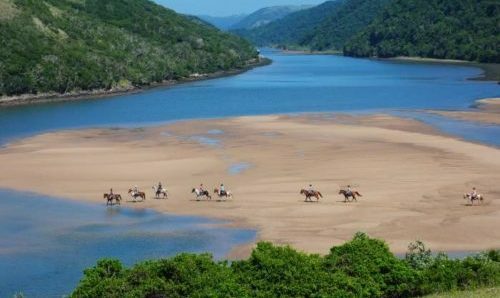 Combine horse riding through stunning scenery teeming with game, and the luxury bush camp based in Macatoo, for a horse riding holiday of a lifetime. 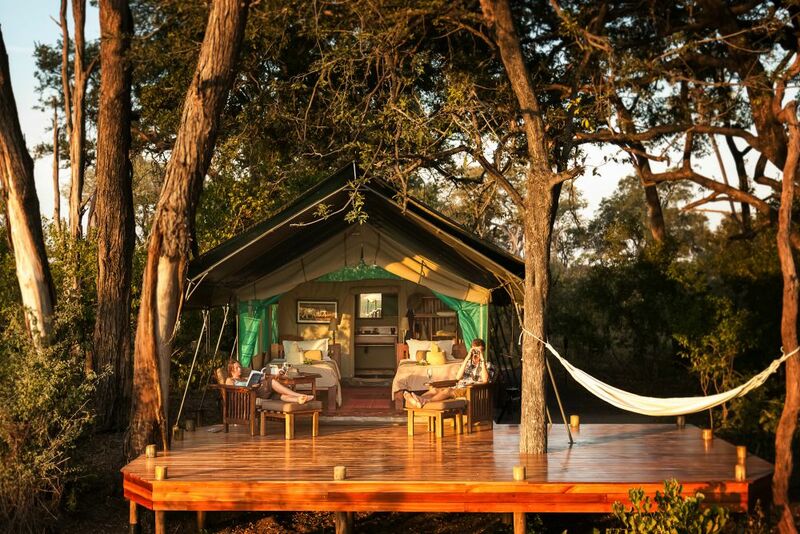 Guests are accommodated in beautifully finished, spacious tents which blend into their surroundings while still providing a luxurious bush haven in which to unwind. All tents are situated upon large, raised platforms with panoramic views of the flood plain. 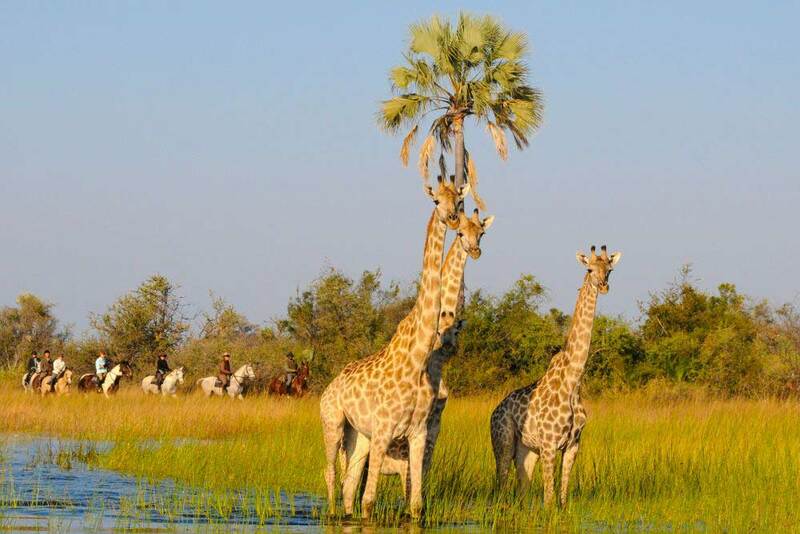 The pace of riding in the Okavango is diverse; ranging from fast and thrilling gallops sometimes alongside giraffe, zebra, in the water and on land, to the gentle stalking of bigger game such as elephants and quiet bird watching. 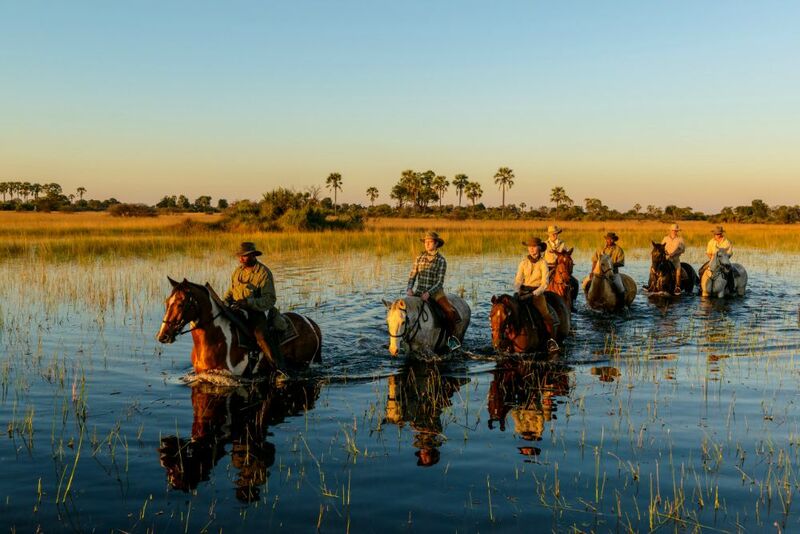 The knowledgeable guides can provide a fountain of information about the wildlife whilst you are on board one of the well-schooled horses; both horses and guides being well versed in Delta exploration. There are nearly 50 horses with a huge array of shapes and sizes and a choice of either western or English saddles. Breeds vary from Thoroughbreds, Anglo Arab, Kalahari-Arab Crossbreeds to Namibian Hanoverians and range between 14hh to 16.2hh. 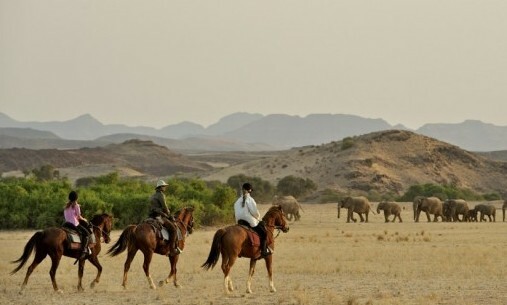 As a result horse and rider pairings are not difficult to form as there is something for everyone and you will normally ride several different horses over your stay. 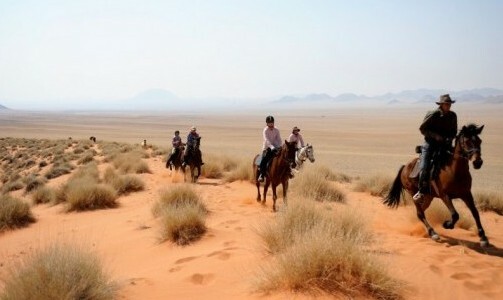 However, in order to ensure the safest and most enjoyable horse safari, riders must be competent at all paces and be prepared to spend up to 6 hours in the saddle a day. 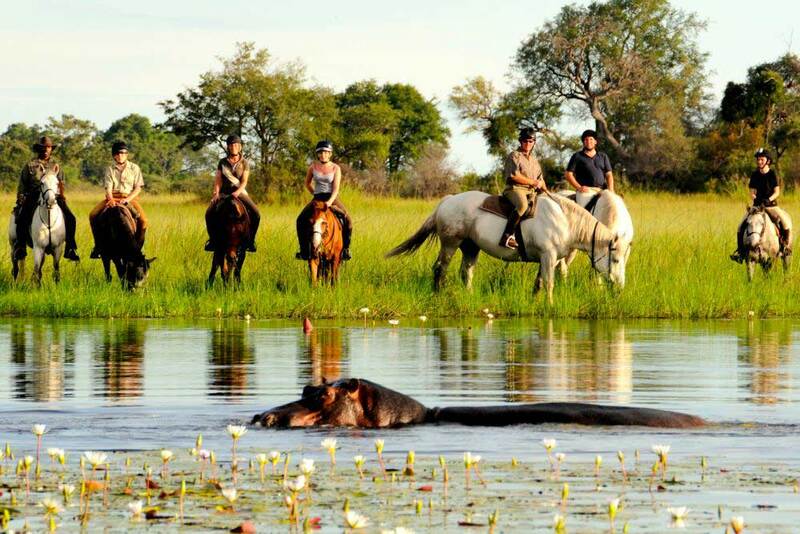 When African Horse Safaris went to ride in the Okavango Delta.. 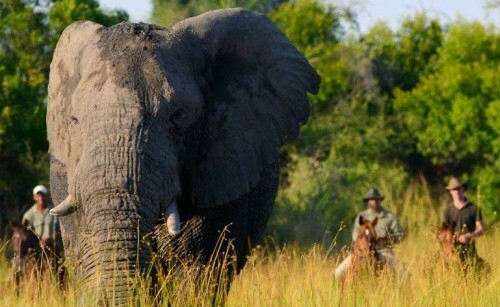 Exploring Africa’s ‘Eden’ and its exceptional array of wildlife. 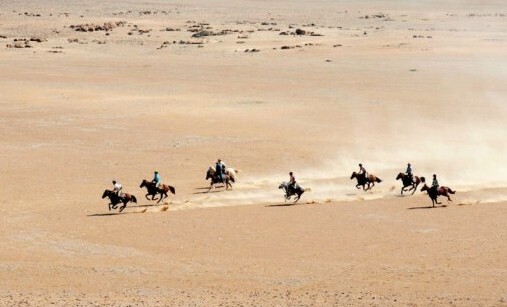 Getting to indulge in some faster paced riding across vast open spaces. 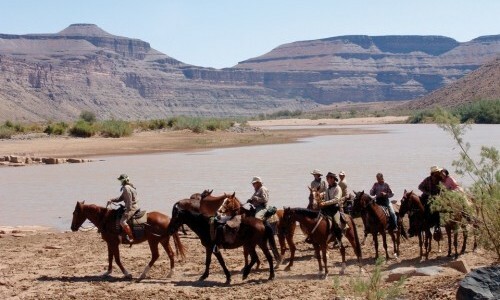 The chance to compliment your horse safari with other activities such as game drives, fishing and boat rides. 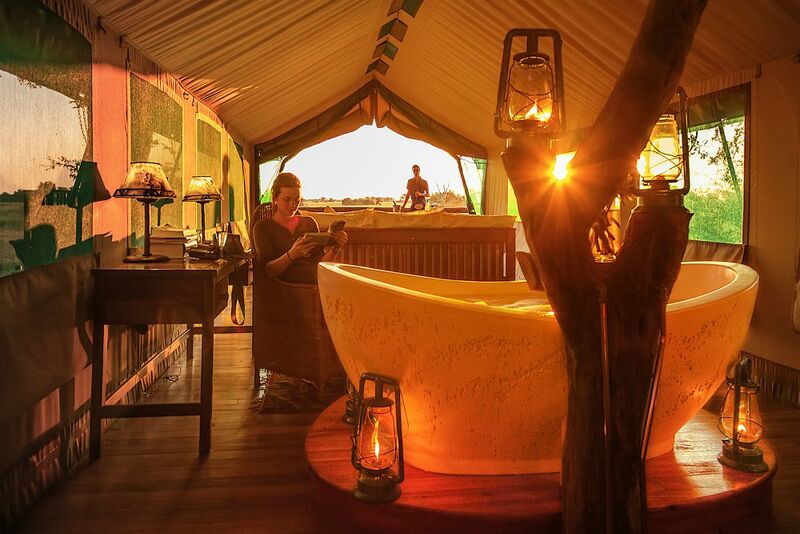 Stunning luxury tents complete with plunge pool and morning tea and coffee brought right to your tent. Arrival and Departure Most common is a flight to Johannesburg, connection to Maun and followed by a charter flight to Macatoo. Then the reverse on return. Length There are no set departure dates so trips can be tailored to best suit your itinerary. There is a minimum stay policy of 3 nights but 5-10 nights or longer is recommended. Riding Level Riders need to be over 12 years old, be riding fit, and weigh no more than 95kgs (210lbs or 15 stone). You must be able to ride to one of the following competence levels: Experienced: Confident at all paces on almost any horse, competes or hunts seriously. Intermediate: Ridden for a number of years. Able to control fit thoroughbreds at all paces. Competent: Able to control a sensible/quiet horse at all paces and feels confident on such a horse. Balanced in the saddle and able to rise/post to the trot. Number of Riders Up to 8 riders per group to ensure maximum safety and enjoyment. Day 1: You will be met at Maun airport and assisted onto your transfer flight into the Delta. The flight is a spectacular experience in itself as it offers a bird’s eye view of the Okavango, and lasts about 30 minutes. A safari vehicle (or one of the local ‘mokoro’ boats depending on the time of year!) will be waiting for you at the air strip to whisk you away on your first 45 minute game drive back to Macatoo Camp. On arrival, you will be handed an ice cold drink and introduced to the staff before being shown to your luxury tented accommodation. After settling in, you will be offered afternoon tea and homemade cake during a briefing from your guide, before heading to the barn for your first chance to mount up. Evening rides are deliberately taken at a slower pace to let you enjoy the sunsets and make the most of those Kodak moments provided by the extensive birdlife and game. After a hot shower, drinks and snacks are served in the comfortable mess tent before sitting down to a delicious alfresco dinner set by the fire. Day 2: If you aren’t woken by the dawn chorus then you will receive a gentle wake-up call and a steaming cup of tea or coffee, from the comfort of your room. A light breakfast is served around the cozy campfire to prepare you for the first long ride of your holiday. 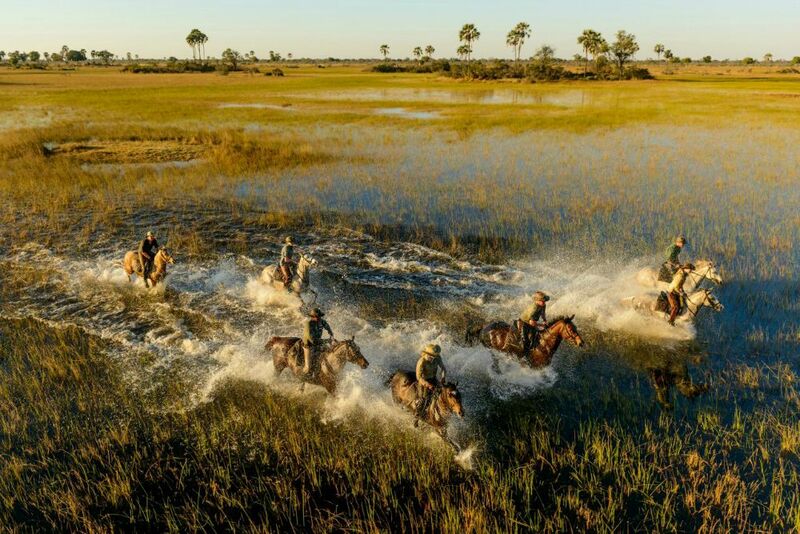 Your morning ride will vary depending on the season but could involve some long canters or gallops across the dried flood plains, swimming through flood waters or navigating the tall grasses in search of giraffe, zebra, antelope, elephant, buffalo – and any other surprises you can find. Back at camp a hearty lunch will be served daily. This proves incredibly popular after all those miles in the saddle and is often accompanied by a glass of wine to lead you nicely into an afternoon siesta before tea and the evening ride. Sundowners are often enjoyed out in the bush before heading back to camp to freshen up before dinner. Day 3: After waking up to yet another glorious African morning, and sipping on a mug of something hot, you will have left any first day nerves behind you and will be impatient to jump on. Taking a new direction, encounter new scenery and the exciting opportunity to see a different combination of game. 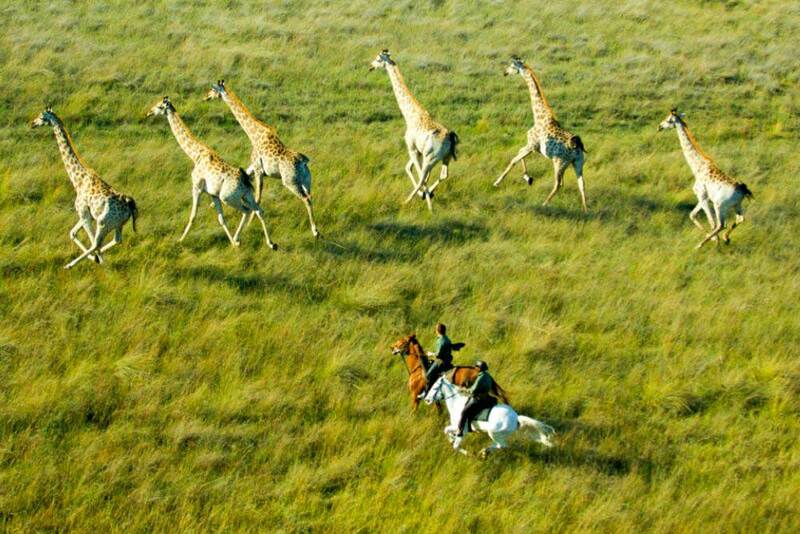 Enjoy picking up the pace and keep up with some of the larger animals such as giraffe or zebra. After lunch, if you don’t fancy a siesta, then read, watch the wildlife go by from your tent deck, or enjoy the camp pool - an ideal place to cool down and escape the midday heat. After afternoon treats of homemade cakes or scones, you have the option to swap an evening ride for some sunset fishing off the boat, or from the banks of a pool often home to the odd wallowing hippo. 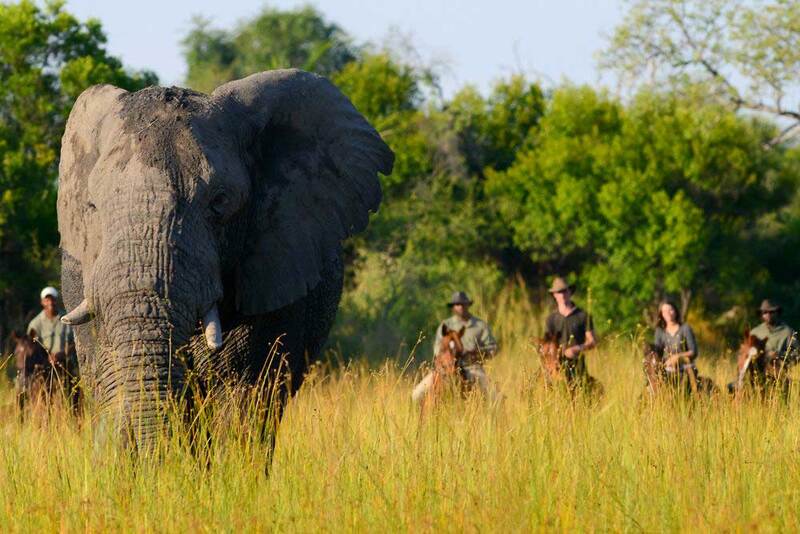 A game drive, accompanied walk or boat rides – depending on the time of year – are also available for those wanting time away from the horses or for non-riding partners and guests. 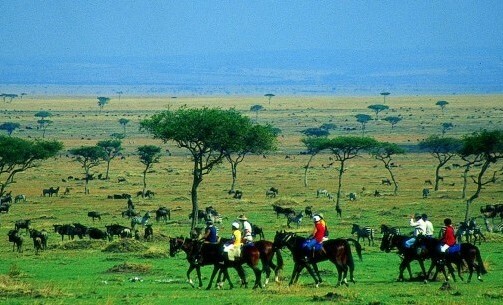 Day 4: Again you will ride through a variety of landscapes, passing clouds of bushman hair grass to plains dotted with fig trees. You might encounter giraffe or shyer antelope while passing through mophane woodlands. When you hit the flood plains, your pace can pick up as you embrace that feeling of freedom which can only be felt on the back of a horse. 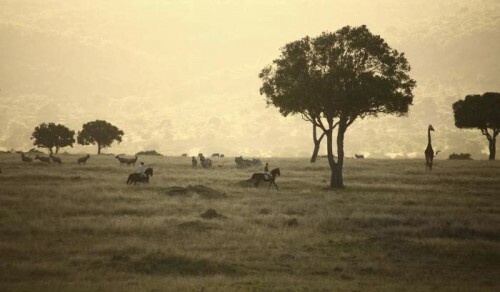 The afternoon offers the possibility of hiring a helicopter for the flight of a lifetime over the Delta (at an extra cost) or finish off the day with a night game drive to find those glinting eyes with the spotlight and seek out game harder to see in the daylight, such as leopard and hyena. Day 5: This morning you will have the opportunity to ride deeper into the heart of the delta, to areas where vehicles cannot follow. 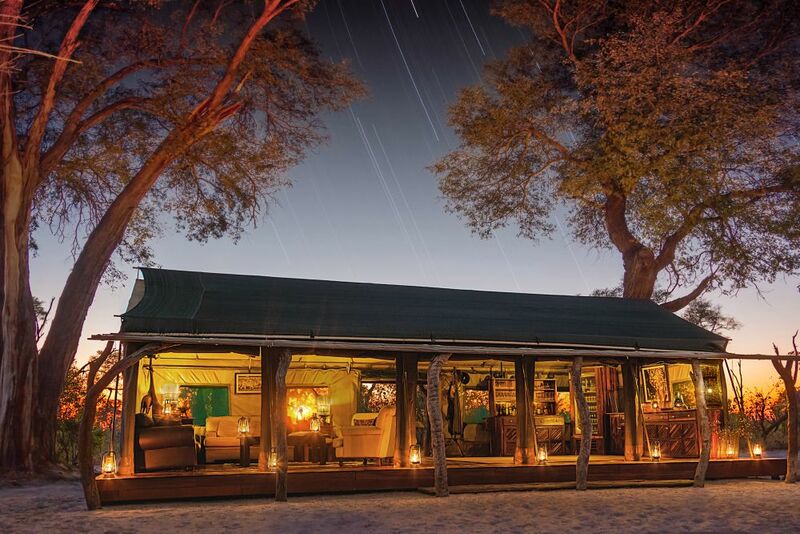 Traverse high palm islands which offer great sweeping views of the Delta plains, before sitting down to a deliciously luxurious champagne breakfast under a large baobab tree. 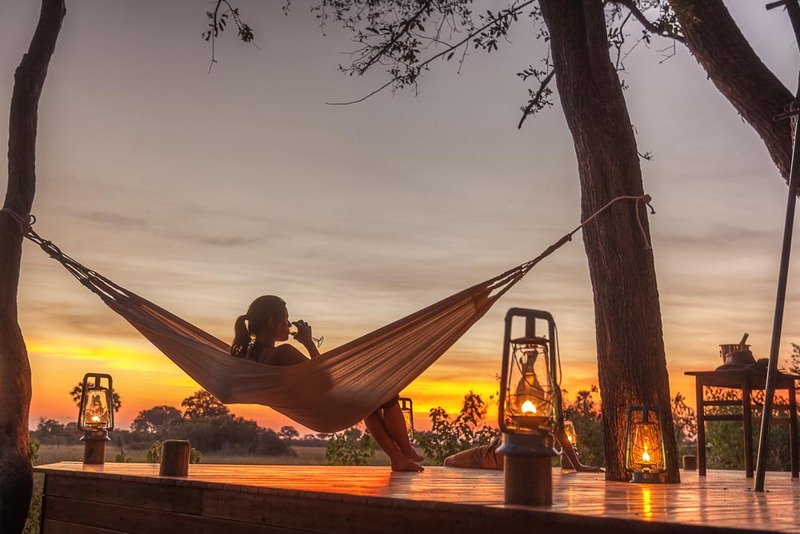 After tea and a relaxed sundowner ride, you may find yourself at the fabulous 'tree house' where you will have the option to spend an unforgettable night out, sleeping high up in the tree canopy under the African night sky. You can rest easy as you guides will be staying too! Day 6: After greeting the African morning from up in the treetops, you are whisked back to camp by vehicle to change before riding out again. 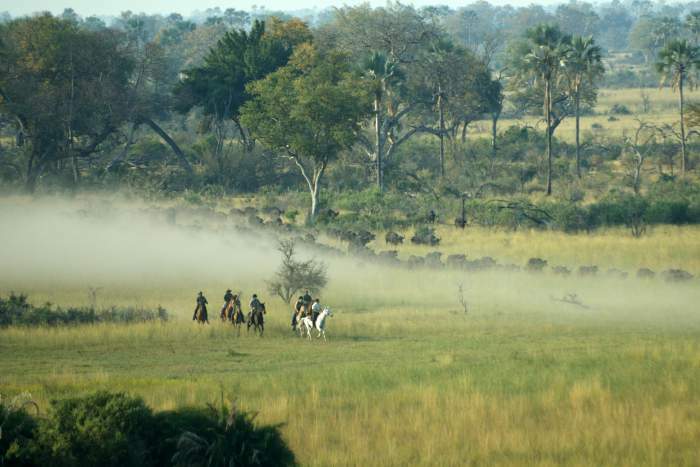 Make the most of a bush breakfast, or lunch out in the bush and savour the sights and sounds around you. The afternoon can be passed as you please and often tricky decisions have to be made as to which of the spellbinding excursions will be chosen today. As usual a candle lit dinner will be served and often prompt bed times are met after last night’s treetop excitement. Day 7: Your last morning in the Delta and it’s time to get wet! Grab your GoPros as you’ll set off to discover the deeper flood plains which are scattered with flowering lilies. The snaps will flow as you wade through (or sometimes swim!) the water, taking in the reflections of the trees, your horse, the blue sky and beautiful flowers. Here, the Cape buffalo can gather in large numbers (anything between a dozen and 2000 at a time). We have to creep up on them using the islands as cover. After a leisurely lunch you will be able to choose your last evening activity. 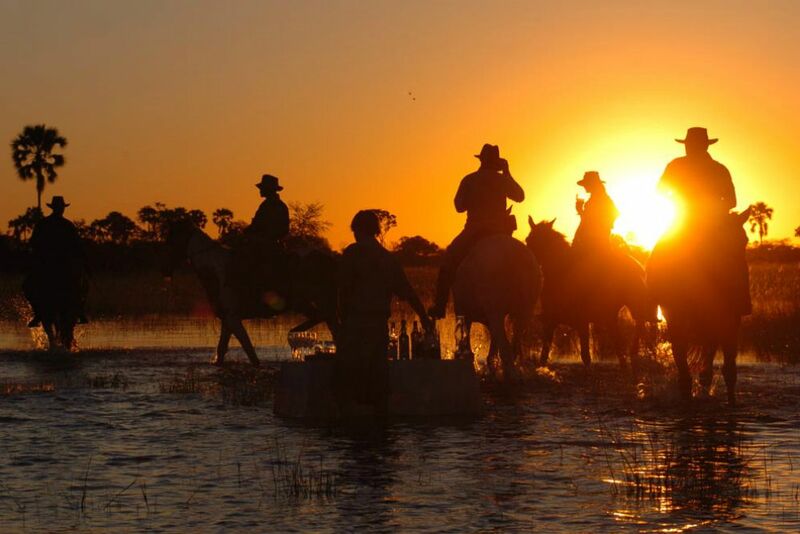 A last game drive, fish or a quiet evening meander aboard your trusty steed in the now familiar Delta landscape and watch the sun turn the sky orange and red with the smell of wild sage in the air. Dinner will be a memorable one perhaps with another surprise location in store…..! 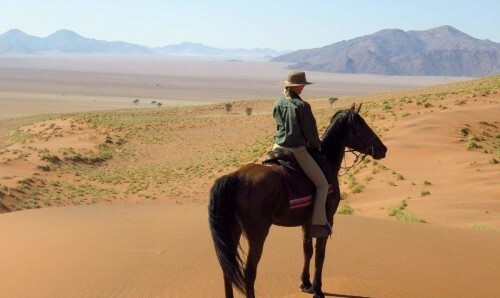 Day 8: One final morning in paradise and a last fun filled and fast paced ride out in Africa’s Eden. 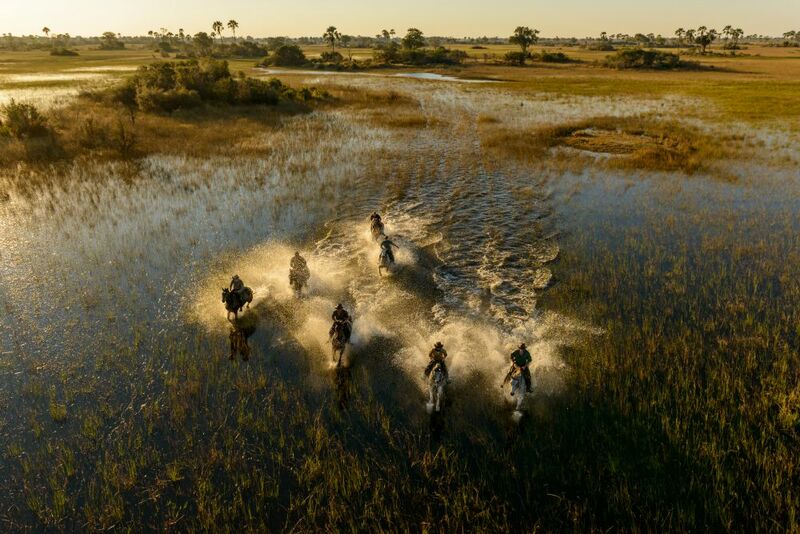 You will go splashing through the shallows close to home and getting your last glimpse of the Okavango’s incredible birdlife as they spring noisily from the reeds after being disrupted by cantering hooves. 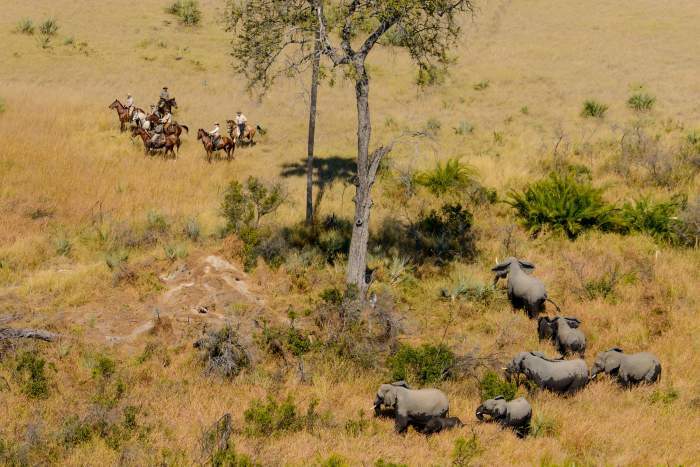 After returning to Macatoo and bidding a sad farewell to your horse you will have time for a quick freshen up before hopping into the vehicle for a game drive to the airstrip. 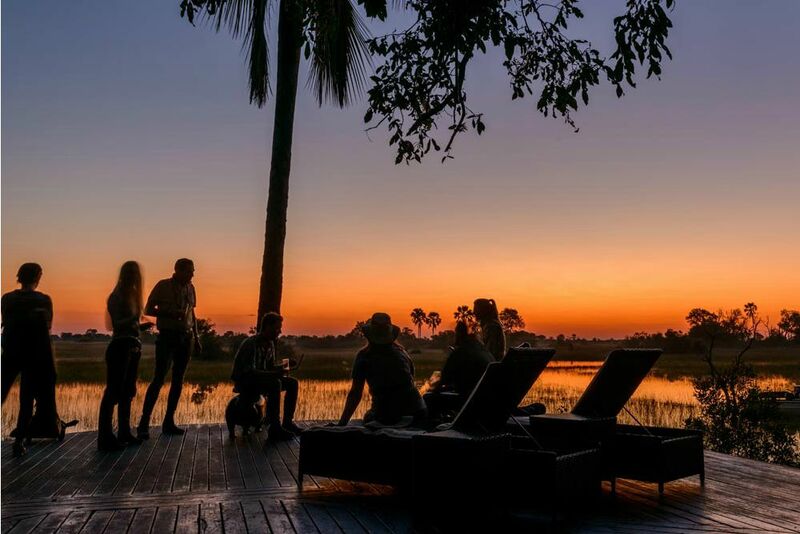 A picnic lunch will be provided to keep you going before you set foot back into life outside the Okavango bubble – a place many can’t wait to return to. All the delicious food and drink at Macatoo Camp and whilst you are out riding. A personal and expert guide throughout your trip. All the riding throughout your stay. Well trained and responsive horses to ride. Book a 10 night trip and get your transfer flights from Maun free! 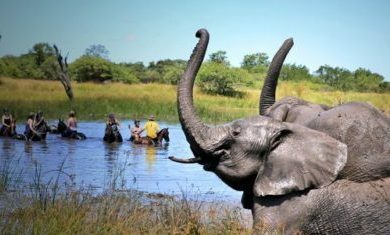 Book a 7 night trip and get your transfer flights from Maun 50% off! 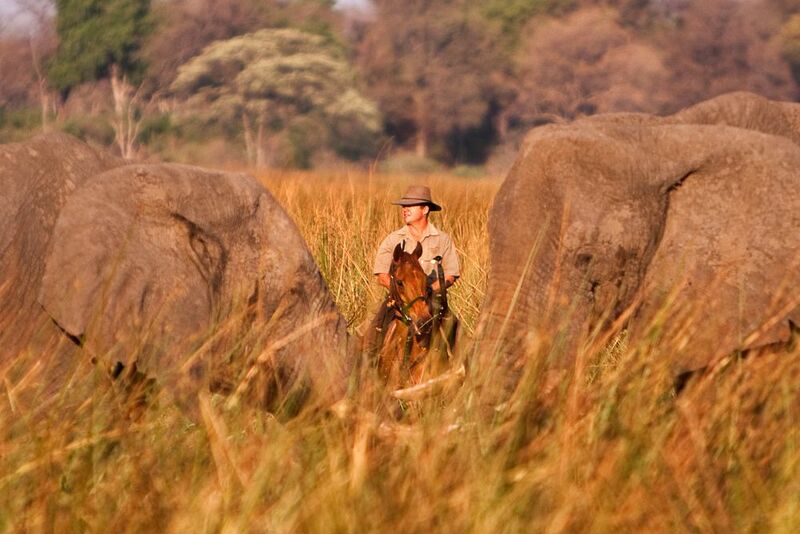 Macatoo camp is a luxury tented camp situated in the idyllic setting of an island in the depths of the Okavango Delta. 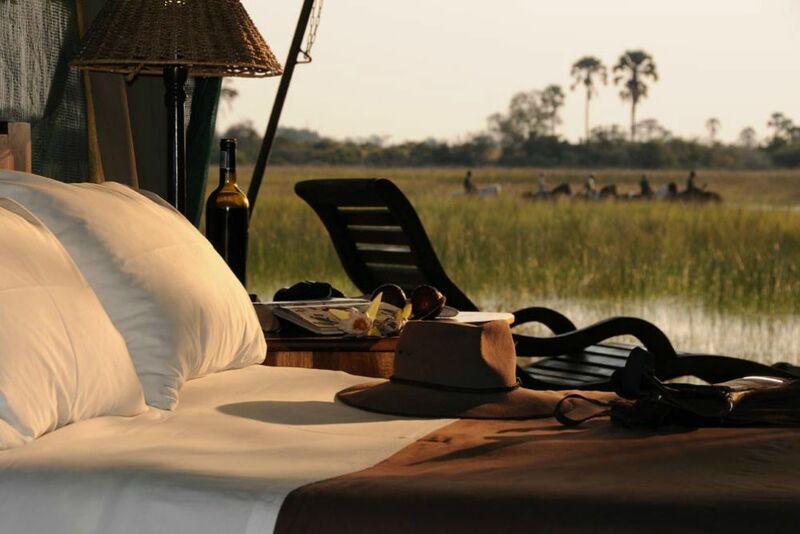 Each spacious twin safari tent is equipped with proper beds, an en suite shower with hot and cold water and a flush loo. 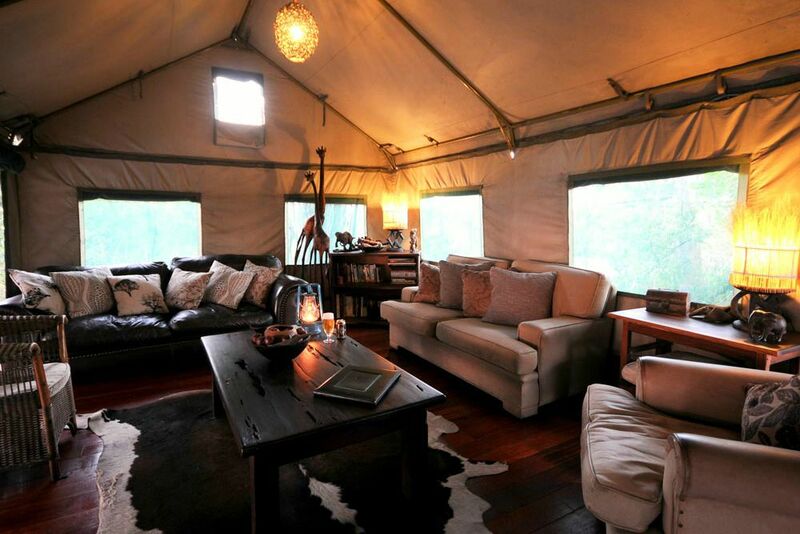 Each tent has a raised deck out front which provides the perfect place to relax, read, and watch the wildlife go by or simply soak up the sun. The luxury doesn’t stop there however; the camp has a large furnished mess tent and a plunge pool for those hot afternoons from October to May. For single travellers there is one single tent, with no supplement, allocated on a first-come, first-served basis. Thereafter guarantee of single tents requires a suppliment. There is no supplement if you are willing to share. There is the option to spend one night sleeping under the stars on a platform up in the treetops. Mattresses will be laid out and each one will have its own mosquito net draped overhead. The Treehouse is lit by candles and lanterns.